Oh, the nuggets the boredom of an offseason brings. We once gave Wilin Rosario the nickname “Chicken Soup” because he was seemingly always on the shelf, nursing himself back to health. If it wasn’t hangnail, he had a cold and was on the roost in the dugout nursing himself back to health with Campbell’s. We panicked in hearing that Rosario was headed to Korea to play ball for the Hanwha Eagles! Wonton’s plane touches down in Korea, he immediately finds a golden throne somewhere and is fed sushi with chopsticks by several beautiful Korean women. He’s wearing nothing but an oriental sequent robe. They believe they are feeding the next Korean home run champion. Phosario misses six months because of a reaction to tempura rolls. Phosario holds a press conference to announce he will return to the lineup a few months into the season on a Tuesday night, gets shocked for a split second when he touches the microphone and decides he needs the night off for being ‘electrocuted’. Phosario misses a total of seven games during the Korean season because he stayed up too late the night before. Not because he was out enjoying the night life, he just stayed up too late watching television and has sleepy eyes in the morning. Phosario tries Miso Soup and then gets a sour stomach, misses a week for food poisoning from Miso Soup! Who gets food poisoning from Miso Soup? It is basically water! Who, you ask? The catcher and soon to be DH who has the immune system of Charlie Sheen, that’s who. Phosario tells his manager that his new oriental sandals he’s been wearing are causing turf toe, and is relegated to pinch-hit duty on the nights he decides he can play. Phosario finally decides to miss the remainder of the season (as if he ever gave actually playing on a consistent basis his all to begin with) because he has a strained buttocks from sitting. He explains to the trainer that it ‘just hurts back there’ – becoming the first player in professional sports to actually get hurt from physically sitting on the bench. This is going to be my first season checking in on Korean baseball, and it’s all due to our friend Wonton “Spup” Phosario. 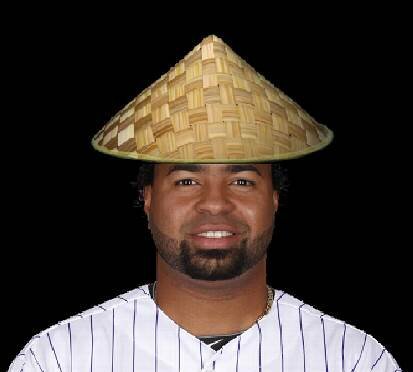 Hat tip to our buddy Corey for the great photoshop of Phosario.